Husband and wife tag­team, Jackie and Sylvia Herron, may have only been racing for four years, but that hasn’t stopped them from wanting to be the very best. Out of 85 starts in 2016, the two have won 28 first place, 21 second place, and 11 third place prizes with their horses. Their current short­term goal is to be leading thoroughbred owners at all of the race tracks in New Mexico, and they are already on their way to claiming that title. Recently, they snagged the title of Leading Thoroughbred Owner at Sunray Park and Casino in Farmington. When the Herrons first began horse racing in 2012, their horses weren’t winning and they became frustrated. Then, when Justin Evans bought one of their horses and beat the Herrons in a race with him, they decided Evans was the trainer they wanted to work with. said Jackie Herron. “He stays at the parks with the horses, so he wakes up with them and he’s with them all the time. 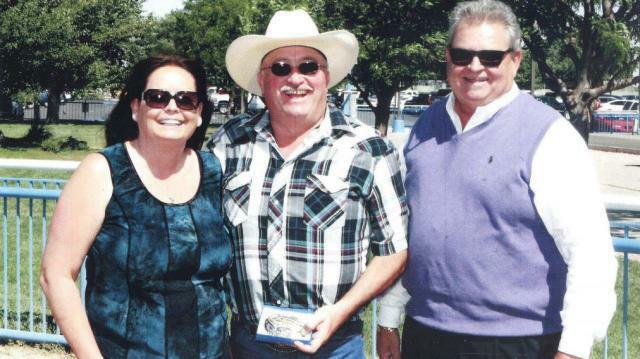 The Herrons are very grateful for what Evans has done for them and for their horses. Jackie Herron said one of the secrets to his success, along with his trainer, is buying horses with constant stamina, as opposed to horses whose specialty is staying in the back of the race until the last lap around the course. Another strategy the Herrons have taken on is the fact that they don’t keep one horse for very long, as they have learned the abilities of a horse will max out. The Herrons sell horses at the same rate they buy them. They go through a constant rotation of horses. One venture the Herrons always have in the back of their minds is getting a horse to race in the Kentucky Derby. “Our trainer is the best in New Mexico,” said Jackie Herron.